How much customer interaction do we need in the project management process? How much involvement do we want them to have as we are designing and developing their critical product that is due to roll-out to end users or the general public in twelve months from now? In the back of every frustrated project managers mind is the answer, “Not at all!” Come on….don’t we all dream of the hands-off customer who tells us what they want and then leaves us alone to do our job for the next few months, only coming back into the picture to test or approve that product, signoff on the project, pay us and then let us move on to our next engagement? Wouldn’t that be so easy? Well, yes…but it should also scare the bejeebers out of you as well. Why? Because the margin for error is huge. The possibility that some requirements aren’t quite right is almost 100%. The probability that we need some key customer information and decisions is more like 150%. So, no customer involvement = high likelihood of re-work and wrong work performed. Ouch. This is the exact opposite of what project management best practices are designed to avoid. What is the best way to interact with our customer? How do we keep them engaged, provide proper status information and updates, review issues, and keep them accountable week in and week out on the projects we are managing for them? Set expectations from the start. At the point of project kick-off – and in the form of some sort of communication plan document – the project manager should set communication expectations for the project. These customer interactions should include meetings, responsibilities, main points of contact, and communication backups, if necessary. Expectations should be set from the start as to how, when and where interaction will regularly happen between the project manager, the delivery organization as a whole (including the entire project team) and the customer. Keep the customer assigned to tasks. Look for ways to keep the customer assigned on an ongoing basis to project tasks and make sure they know that they need to be accountable for reporting regularly on the progress of these tasks. Nothing keeps team members and project customers alert and engaged like knowing they have reportable tasks on their plate. That tends to keep interaction at an all-time high throughout the engagement. Be consistent with meetings. Always try to be as consistent as possible with your project meeting schedule. Regularly cancelled meetings send the wrong message to your attendees. It tells them that you are disorganized and that your meetings aren’t that important. Regular attendance will dwindle and so will customer interaction, participation, and – likely – confidence. Involve them in key decisions. I like to involve the customer in all key decisions. Not necessarily the decision itself – unless their input and involvement is critical. We don’t want to appear weak, needy, or not in control to our customers, however, we should definitely inform them– especially when making critical decisions that will affect the customer and the project. The customer will hear about these moves and decisions – it’s best that they hear about them from the project manager. 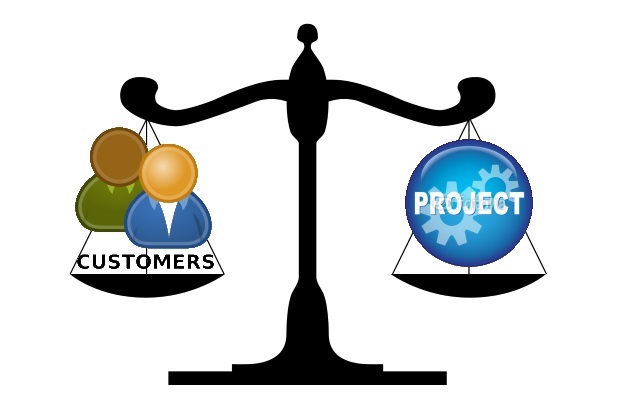 The bottom line is this… we need our project customer to be fully engaged. Without that ongoing customer interaction, the project suffers, the end product design may suffer which can be catastrophic, and failure is the likely outcome. Therefore, we must work pro-actively with some customers to ensure they remain engaged and available throughout the project – and work on creative ways to keep them actively contributing to the project on a daily or weekly basis. How about our readers? What issues have you experienced in keeping your project customers engaged on projects and product design efforts when their jobs may be pulling them in ten different ways? What strategies have you employed to keep them involved or to make themselves available to you when you need them?